After you get your paint tester, it’s time to start painting with Sure Swatch. 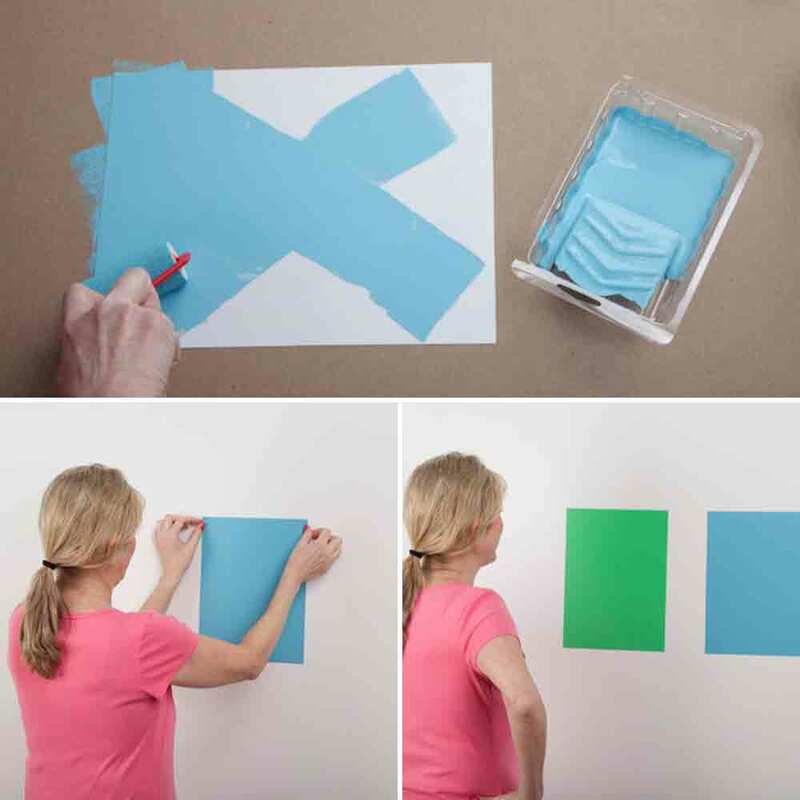 With the Sure Swatch’s UNPRINTED side up, apply the paint generously in a corner-to-corner “X” pattern. Paint in a side-to-side motion and then in an up and down motion to completely cover the sheet. As a final step, roll in one direction from top to bottom in a series of strokes covering the entire sheet. Let the first coat dry until it feels dry to the touch. Apply a second coat using the same method. Again, be sure to let it dry to the touch. Drying time is approximately 20-60 minutes depending on the surrounding temperature and humidity. While you might be tempted to make your color choice by looking down at what you have just painted, it’s important that you position your SureSwatch on your wall for viewing. After the painted SureSwatch is dry, crack on the dotted line to remove your painted SureSwatch. Place the SureSwatch on the wall at approximately eye level or slightly above. When painting with SureSwatch, DO NOT use it on wallpaper, recently painted surfaces, unpainted drywall, or other easily peeled surfaces. Walk a few feet back from the wall and delight in how good your sample looks and how easy it is to decide which color to go with. Once you’ve made your choice, remove the SureSwatch and discard. SureSwatch removes easily and cleanly, just be sure to remove within 14 days of viewing. More of a visual person? Click here for a step-by-step video on painting with SureSwatch. And if your color doesn’t look like the manufacturer’s color chip, the paint probably has poor covering power. Click here for directions on using the SureSwatch Primer Decider Scale.